China's Chang'e 2 probe, repurposed for an extended mission after surveying the moon, flew by asteroid Toutatis last week and returned the first up-close photos of the potato-shaped object. The car-sized spacecraft zipped about 2 miles from Toutatis, allowing its camera to snap several images of the asteroid, according to Xinhua, China's official news agency. Chang'e 2 is the first Chinese spacecraft to travel beyond the moon. Robotic probes from the United States, Europe and Japan previously observed asteroids from nearby. The flyby occurred Dec. 13 as Toutatis was about 4.4 million miles from Earth. The three-mile-long asteroid made its closest approach to Earth on Dec. 12. NASA collected a series of radar images of Toutatis using a 230-foot tracking antenna in Goldstone, Calif., revealing the asteroid is in a slow tumbling spin. The closest portion of Chang'e 2's high-speed encounter lasted just a few minutes, and the probe's science instruments were not activated for the flyby. But imagery from Chang'e 2 reveals a barren, mostly smooth, elongated object blemished with scattered boulder-like features. The point of closest approach was at 0830 GMT (3:30 a.m. EST) Dec. 13, according to the China's State Administration of Science, Technology and Industry for National Defense. 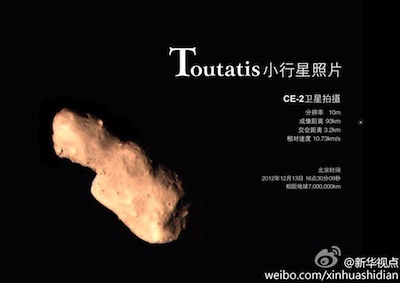 The relative velocity between Chang'e 2 and Toutatis was about 24,000 mph, Xinhua reported. Launched in October 2010, the Chang'e 2 spacecraft orbited and mapped the moon for eight months before being dispatched to the L2 libration point, a gravity-stable point a million miles from Earth. China selected the asteroid flyby for Chang'e 2's next task, and the probe departed the L2 location earlier this year. Chang'e 2 has set the record for the most distant Chinese space probe. By January, it will reach a distance more than 6 million miles from Earth, according to Xinhua. The spacecraft is the second lunar orbiter built by China. 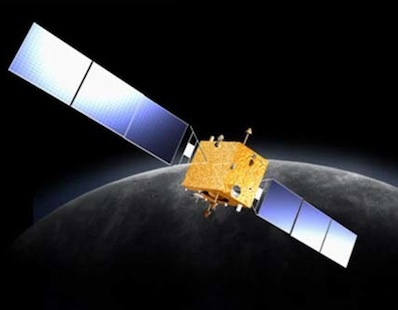 Chang'e 1 launched in October 2007 and examined the moon before it was deliberately crashed in March 2009. One of Chang'e 2's objectives at the moon was to find a suitable landing site for China's next moon mission, a robotic nuclear-powered lunar rover scheduled for launch in the second half of 2013. China named the Chang'e lunar exploration program after the Chinese goddess of the moon.